Victoria remembers its colourful history with First Nations totem poles, heritage architecture and afternoon tea. Shop windows are full of British imports, Native art and the latest trends. Restaurants and cafés serve the freshest cuisine. The harbour is alive with the romance of an era when tall ships moored alongside the wharf and evenings glitter as lights twinkle and cast their magic from atop the landmark British Columbia Legislative Buildings. The Garden City is a year-round tourism destination that offers a friendly, safe haven for all visitors. Getting here is very easy, and, once here, you will feel a million miles away. With a clean environment and charming ambience, it is no surprise that Victoria, BC is one of the world's favourite destinations. Victoria is a scenic 1.5 hour ferry ride from Vancouver or 4 hours from Seattle. Summer is peak tourist season, so be sure to reserve your spot on the ferry. Arrival can also be arranged by air, float plane, helijet or land plane. Be it legends and lore, ceremonies and potlaches or totems and masks, the First Nations people's heritage and legacies live on in Victoria and on Vancouver Island. A First Nations experience adds a special cultural flavour to any visit to Victoria. Visit a museum or a cultural centre, attend a powwow or take a Native heritage tour around the Island to truly learn about Victoria's history. Take a short ferry ride where you are likely to see a pod of whales and visit The Gulf Islands. These islands which hug the west coast of Vancouver Island encompass Salt Spring, Mayne, Galiano, Pender, Gabriola and Saturna islands. Each island holds a charming collection of laid-back villages and is worth a visit. 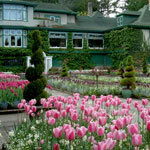 You will find yourself coming back again and again to Vancouver Island and Victoria, BC.